The album Piña Colada by Cave Art is a special blend of weird pop, DIY synths (you might have heard of their ‘Standuino’ synth), and live improvisation. Heavily influenced the by the pre-90′s Czech generation of ‘bastlers’ – people building electronics at home in the context of the Soviet regime, Cave Art continue that tradition by soldering their own electronic instruments. Once finished, they accompany their electronic creations with strange-looking guitars and free vocals – singing the story of a smuggler from the future. Painting on the walls of 21st century with less formalism and more of a ‘pure’ colour. 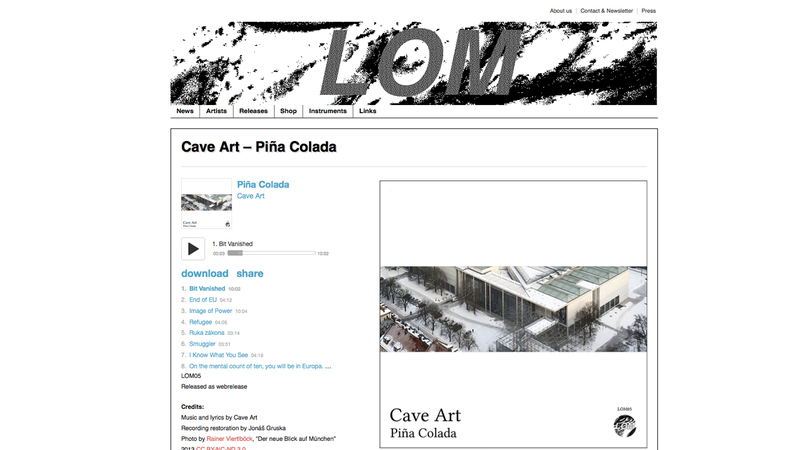 Piña Colada was recorded live on 31.5.2013 at Schaustelle, Pinakothek der Moderne, Munich, Germany.